FOOTHILL RANCH, Calif., Sept. 29, 2011 (SEND2PRESS NEWSWIRE) — Quandis, Inc., a leading provider of default management mortgage technology solutions, announced it has released a Web-based short sell application that automates short sell workflows and streamlines communications between servicers, lenders, borrowers and real estate agents. The result is the efficient, effective processing of short sale transactions that can be executed in roughly 60 days. Quandis’ short sale solution is designed for use by services to automate their back-office workflows and offer them a centralized Web portal where other pertinent parties involved in short sell transactions can log in to manage their tasks, upload documents and view status. The application integrates with leading mortgage servicing platforms and is completely configurable and customizable to the servicer’s unique short sell process that their negotiators and processors must follow. Servicers, lenders, investors, borrowers and real estate agents all have separate logins to the Web portal that standardize the format in which information is submitted and establishes much needed transparency. The solution allows servicers to receive and complete short sale packages directly from the borrower or its listing agent, which includes complete financials, property valuation data, lien verification and all supporting qualification documentation needed from the borrower. Quandis also incorporates a loss analysis tool into the application to assist servicers with the decision and approval process. Multiple offers can easily be received and negotiated electronically. * Single, centralized view of borrower, servicer approvals, property listing, identification and approval of buyers and offers, and monitoring of the property sale. * Structured process and format for the seller and buyer’s agents. * Alerts, event triggers and email updates that ensure tasks are completed and up-to-date status is provided to borrowers and listing agents. * Wizard that walks the borrower through the steps needed to apply for a short sell and submit required documentation. * Easy, quick generation and access to all documentation needed to complete a short sale package and deal negotiation. * Instant access to current credit reports and lien verifications. * Ability to configure and customize servicers’ preferred workflows. * Robust reporting tools that allow users to track milestones, approval dates and any relevant information needed for compliance and analysis. * Direct, real-time interface with leading mortgage servicing platforms. The company will be holding discussion times with interested parties at the Mortgage Banking Association of America’s 98th Annual Convention and Exposition at the Hyatt Regency in Chicago, IL, October 9 – 11. 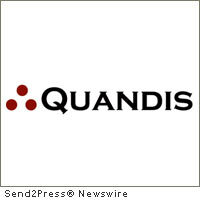 To secure a meeting with Quandis, contact Laura Hadley at 949-382-1178 or via email lhadley@quandis.com . Founded in 2002 and headquartered in Foothill Ranch, California, Quandis is a default management software provider specializing in Web-based solutions for the lending industry. Quandis’ solutions include foreclosure process automation, short sale portals, skip tracing systems, a valuations hub, military search services, bankruptcy status searches, collection solutions, as well custom application development. The company’s clients range from lenders to banks, servicers, foreclosure attorneys, outsourced service providers, and agents and brokers. With over 20 years of experience in developing solutions, Quandis understands the unique requirements necessary to deliver enhanced workflows and business-to-business communications. Quandis was named to Mortgage Technology Top 50 Servicer Provider. For more information, please visit www.quandis.com or call (949) 525-9000. Original Keywords: CEO Scott Stoddard, SaaS, Quandis Inc, default management mortgage technology, quandis, scott stoddard, military search services, skip tracing, foreclosure process automation, lending industry, California business news Quandis, Inc. Foothill Ranch California FOOTHILL RANCH, Calif.
REFERENCES: Banking News, CEO Scott Stoddard, SaaS, Quandis Inc, default management mortgage technology, quandis, scott stoddard, military search services, skip tracing, foreclosure process automation, lending industry, California business news Quandis, Inc. Foothill Ranch California FOOTHILL RANCH, Calif.